Green Thumb Company, owned by Allen and Amy Harmon, has been providing professional grounds maintenance services to residential and commercial property owners in the Whatcom County area since 1988. We are conveniently located in North Bellingham and serve the surrounding areas throughout Bellingham and Ferndale. and some in Lynden. We create and maintain beautiful grounds and landscapes, know the importance of upkeep, and offer the latest innovations and local materials. Our services add both value and beauty to any property. 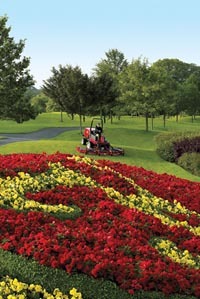 We offer one time or regularly scheduled grounds maintenance. We understand the challenges that landscape maintenance offers in the Pacific Northwest. Whether it concerns basic lawn care, flower bed and plant maintenance, moss invasion or hedge and tree pruning we know how to face these challenges with experience and professionalism. Green Thumb Company is a full-service grounds maintenance company that feels confident in our ability to meet all of your expectations. We have a commitment to provide great landscaping services with outstanding customer satisfaction and have been serving Bellingham and Ferndale for more than 20 years. We attribute our staying power to being dedicated to you, our customer. Flower, Shrub or Tree Planting …And more…just ask! Are you in need of a residential or commercial grounds clean up? Tell us about your landscaping needs. Call Green Thumb Company or Request a Quote directly from our website. Call us today!